Way back 2012, I was sitting in a small hotel room in Tennessee with my little family, armed with a laptop and lots of downtime. I was looking at shoe makeover tutorials and thought "Hey, I should do a round up series on many ways to turn old shoes into custom kicks. "...or something to that effect. Then, I wrote five posts about add Gems, Glitter and Sequins, adding Studs, Spikes and Chains, Covering with Fabric, Lace and Paper, Temporary Additions, and Painting Them. To my shock, this series is still getting a huge amount of traffic. In fact, people Googling for various shoe tutorials is my main site traffic. Of course I've done my own Shoe Tutorials since then too, which get their own traffic. I get the occasional email asking ME to makeover their shoes. It's always the same two questions "Can you dye/paint my suede/fabric shoes for me?" and "How do I cover my shoes (usually specifying shoe type) with fabric?" I'll be honest, I've never done either of these things, which I tell each person and try to guide them in the right direction...usually their local cobbler. There was some definite confusion as to if I created all of those tutorials in the round ups, despite including all the sources twice in each post. I have some more of my own shoe tutorials planned to answer some of these questions myself...ie. 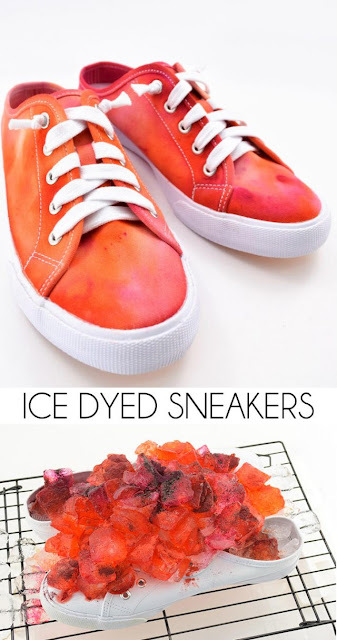 dye and cover shoes with fabric. To answer one of the questions on dyeing shoes...a topic I left out of my original series, here are a bunch of awesome tutorials on dyeing your shoes. You can NOT turn a dark shoe into a light shoe with dye! YOU CAN NOT! You can NOT bleach shoes! Bleach will damage your shoes. Trust that this is an awful idea. You can NOT dye shoes a color opposite the existing color on the color wheel...ie: can't turn a blue shoe into a red shoe with dye, it will turn purple. You can NOT dye synthetic shoes like pleather...don't even ask. Natural materials are best for dyeing. Dye is unpredictable and messy. It reacts differently to each material. Dye can NOT cover up stains. It's sheer and reacts to the existing shoe color. PLEASE WEAR GLOVES. Unless you think dyed fingers are awesome, please wear gloves when handling dye. If you are trying any of these things on your old dark beat up shoes, see the PAINT THEM TUTORIALS. I have NEVER dyed shoes myself. 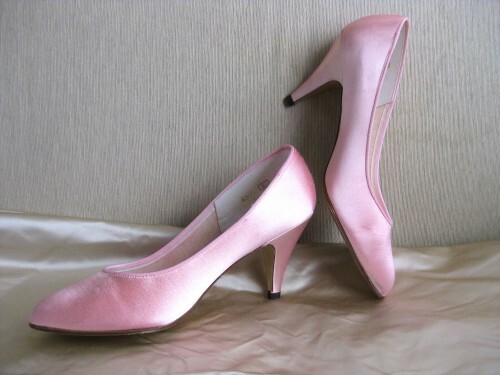 I did have someone else custom dye satin shoes to match my prom dress, way back in high school. The dye ran as soon as it touched wet grass, so keep that in mind. Don't email me questions on dyeing shoes, because I can't help you. I'll tell you to do more research and direct you back to this post to read it again. The Dreamstress explains Dyeing Fabric Shoes to match a dress, working in layers. 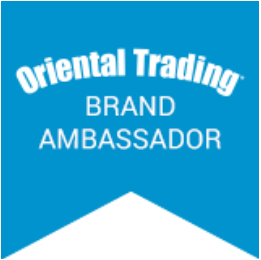 She has lots of great tips, some of which I included above. 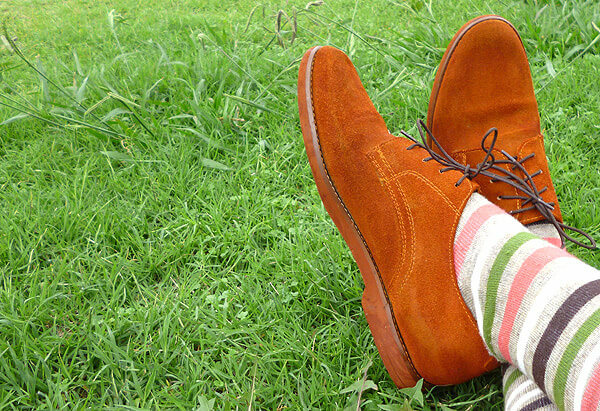 Keep in mind that dyed natural shoes aren't always color safe...meaning that the color can fade with exposure to say wet grass might result in the color bleeding. This isn't true of all dyes, but it's a dyer beware thing. I Fit It shows How to Dye Faded Canvas Shoes, because sometimes you just want to revitalize a pair of old Chucks and don't want to replace them. Similar to polishing leather shoes, this is redying canvas shoes. 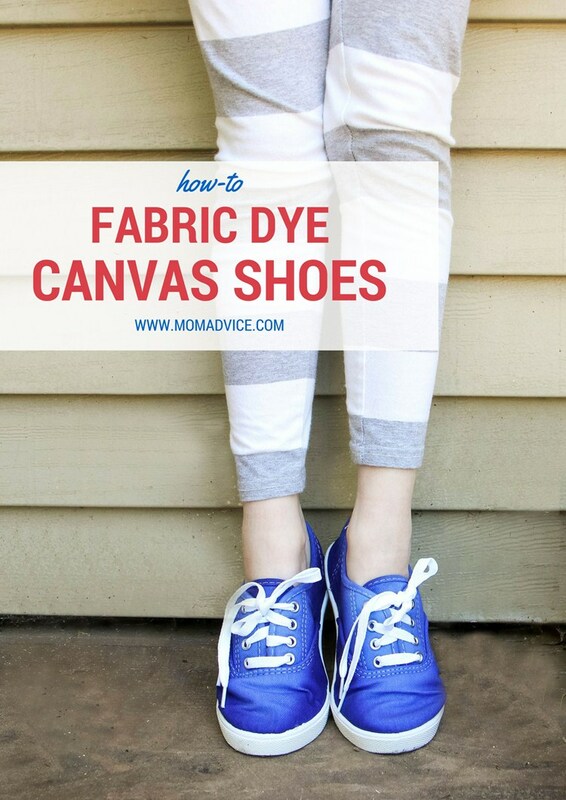 Mom Advice shows How to Dye Canvas Shoes in this straight forward tutorial. This project uses the stove top method of dyeing, by covering the shoe bottoms and edges with masking tape and dipping the shoes into the pot of dye. I'd probably throw the laces into the pot too, for something unexpected. 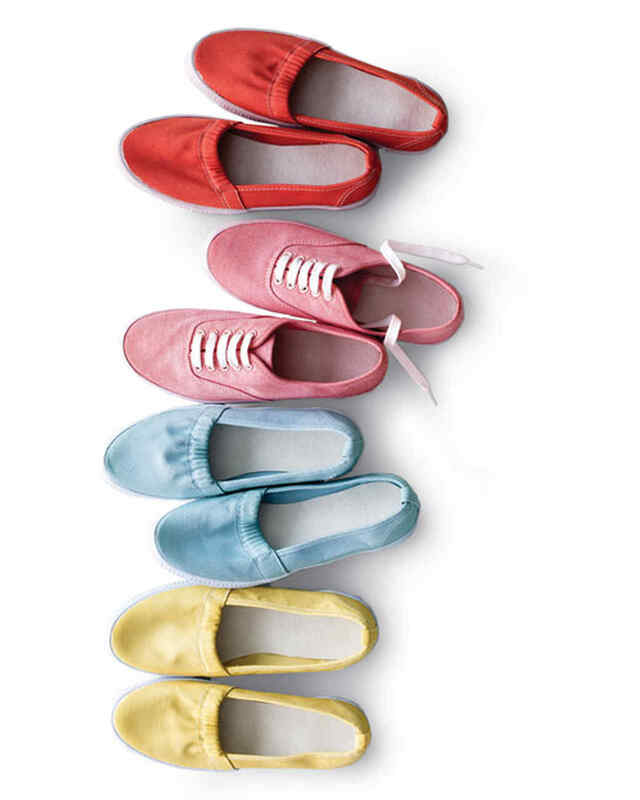 Martha Stewart shows Dyed Canvas Shoes using a container instead of a pot. This lets you use that boiling water to make different colored dye baths. As you see with these shoes, the different canvases didn't absorb the dye the same. Some are more muted colors, while others have bold colors. 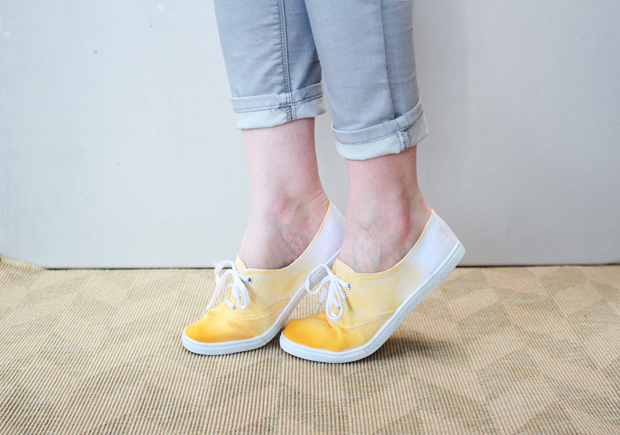 From Frankie Magazine, Danielle Altamura shows Dip Dyeing Shoes, for those times when you want a color gradient. 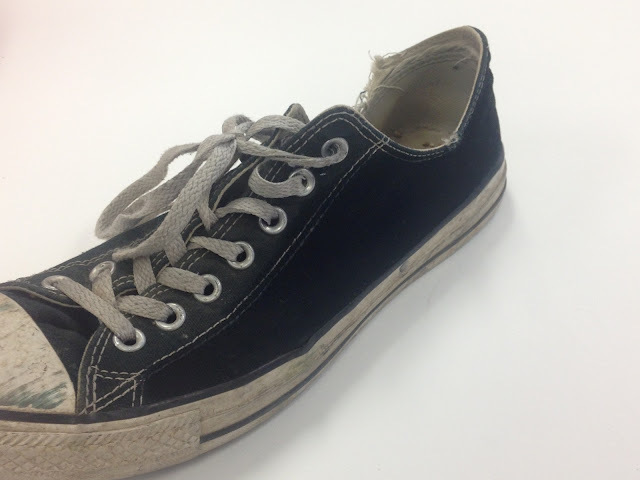 This is similar to dyeing the full shoe, but involves wiping the color back towards the white by using a damp cloth. Mom Spark shows Ice Dyeing Sneakers, which is a cool effect that uses lots of ice and powdered dye on the sneakers. You must wait for the ice to melt before seeing the random dyed design. 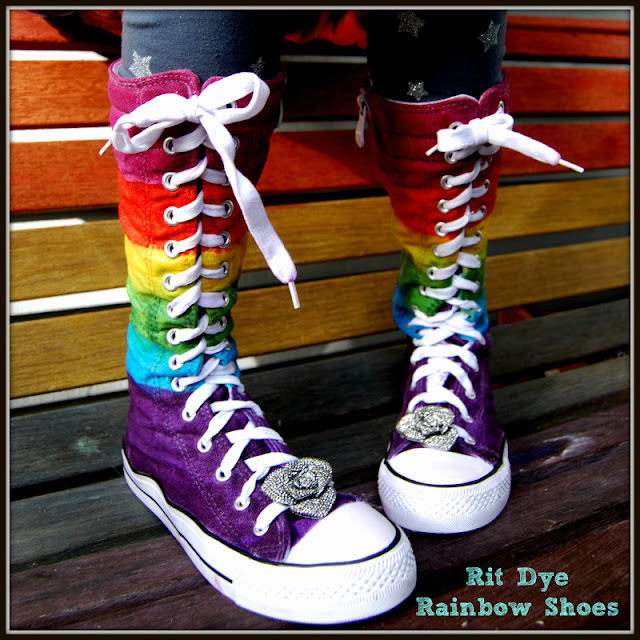 On Rit Studio a Tutorial by Angela Daniels shows how to make Custom Rit Dyed Rainbow Sneakers. Y'all know I love anything rainbow. She hand painted the dye onto the shoes. For added color protection she used Rit Color Fixative and Scotch Guard on the dyed shoes. 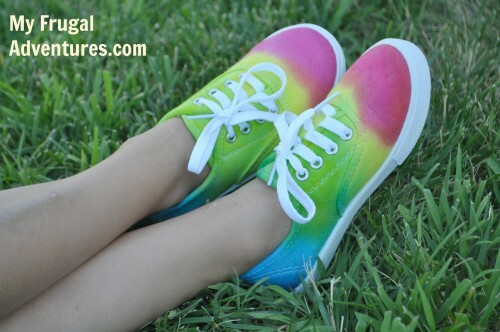 My Frugal Adventures Tie Dyed Children's Shoes, by turning cheap white canvas sneakers into colorful beautiful kicks. This tutorial features two pairs she did using the same colors and methods, but with different results. I like the blending between the colors. 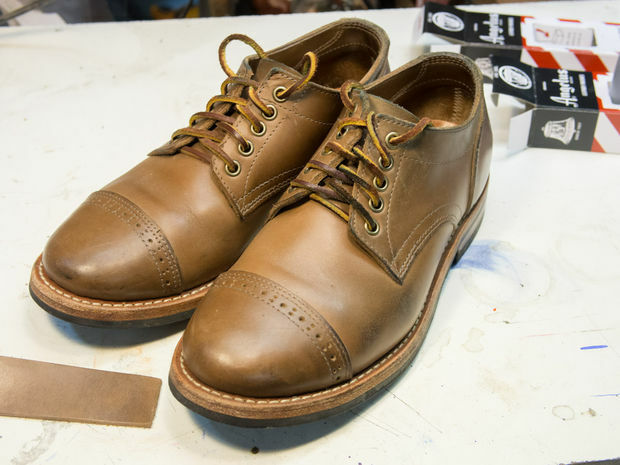 DIY in PDX shares Tips for How to Dye Leather or Suede, by turning a pair of suede and leather boots from brown to black. 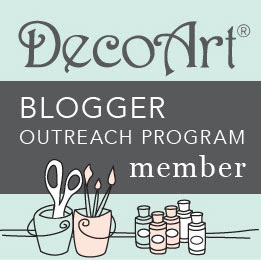 She has lots of great tips on what to expect when dyeing leather/suede shoes and how to get the best results. 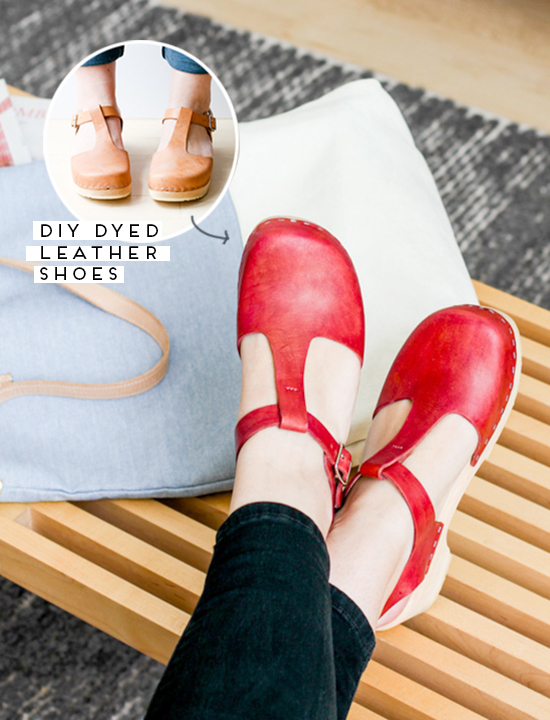 On Instructables, a tutorial by Phideaux shows how to Dye Your Shoes or Other Leather Goods. He goes into a lot of great detail on dyes, colors, finishes and how to dye leather goods. There's lots of photos with before and afters, so you can see exactly what he did to these shoes. Paper and Stitch shows How to Dye Leather Like a Pro, using a high quality textile dye instead of a leather dye. She turns tan shoes into red beauties by hand painting the textile dye onto the leather shoes. She has a lot of great tips on what to expect for even coverage. 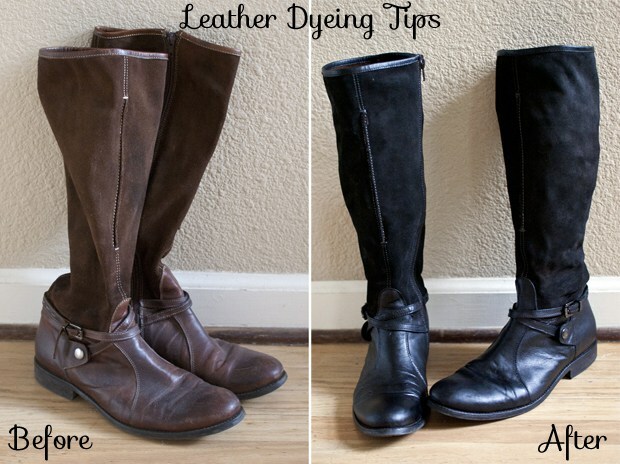 The Band Wife Blog shows How to Dye Your Leather Boots. She strips, dyes and adds sheen to these old boots, making them perfect for any gal who's a little bit rock n roll. Plan B Anna Evers shows How to Dye Leather Shoes. She strips, dyes and polishes a pair of heels. Heels are different challenge that flat shoes, as the soles are exposed. You can cover the underside of the shoes with masking tape before dyeing if you don't want the soles dyed. Or you can strip and dye the outer and soles of the shoes. 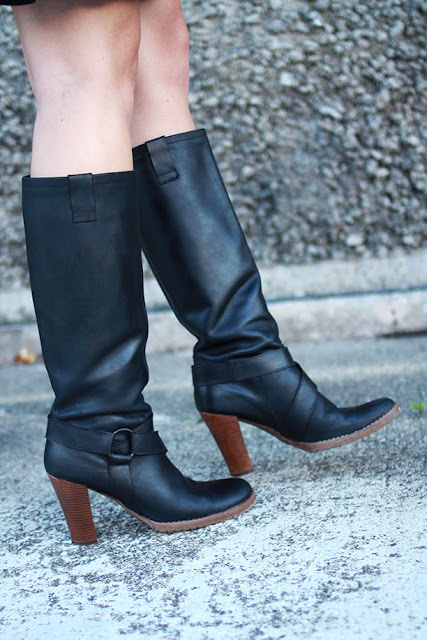 Sassy Feet explains All About Dyeing Suede on the favorite casual boots, Uggs. I know! I know! These aren't super fashionable anymore, but you all know you have a pair stashed away that's seen better days. Clean them up and if they aren't too splotchy, dye them. 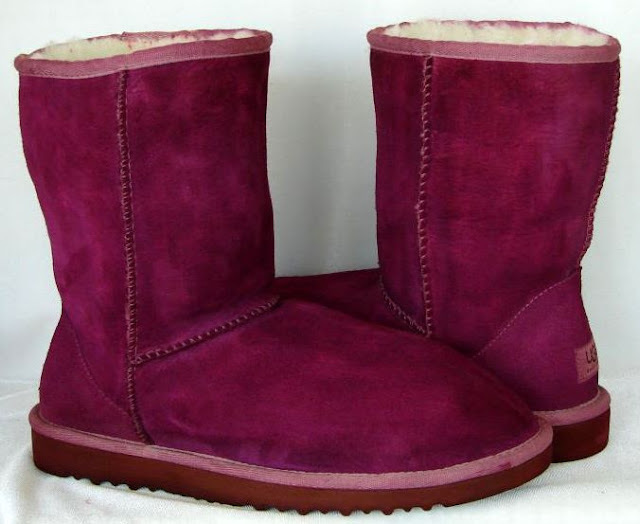 This is also a great way to give tan Uggs a custom color. Do It Yourself shoes How to Dye Suede. They explain that old suede sometimes just need rejuvenation to become pretty again, so they start with that. If you want the suede a different color, obviously dye is the way to go. Dream A Little Bigger explains Dyeing Suede with Excellent Results. She turned a worn pair of thrifted suede shoes from dirty tan to rich orange. She even dyed the soles so they'd blend well with the suede. A pair of new laces finishes off these shoes. 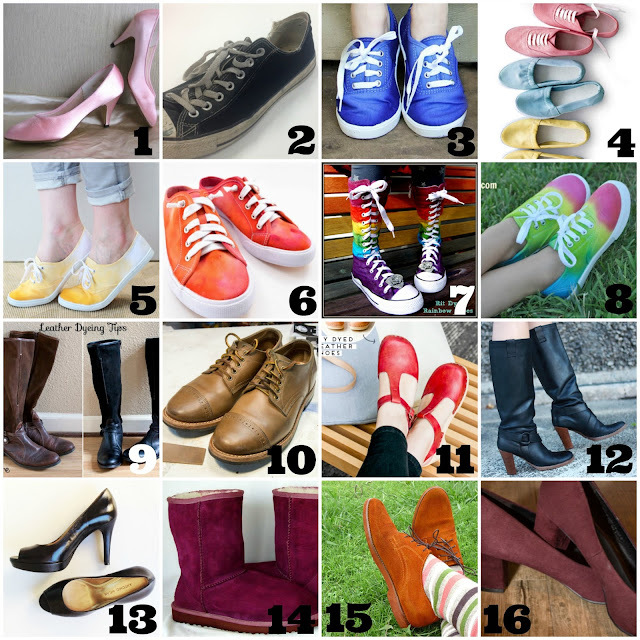 Hopefully this round up answered your "How do I dye shoes?" questions. I did some research on dyeing patent leather, and all of the tutorials I came across were salvaged disasters. The patent coating protects the leather from many things including dye. There wasn't really a consistent way to strip off that coating and get beautiful results. Normal leather can be easily dyed, but patent leather is a challenge that even I wouldn't try. Consult a cobbler (shoe repair person) on any shoes you don't feel comfortable redoing yourself. For fabric shoes, natural fibers will give the best results, but all fiber aren't equal, so don't expect the colors to look the same on canvas as they do silk. If you now want to makeover all of your shoes, check out my DIY Shoes Pinterest board. It has a few hundred ideas that are sure to keep you busy for a while. Also check out my previous Shoe Tutorials and round ups Gems, Glitter and Sequins, adding Studs, Spikes and Chains, Covering with Fabric, Lace and Paper, Temporary Additions, and Painting Them.